Gain valuable insight into common psychotropic medications, including both the helpful effects and potentially problematic side effects, that these individuals are prescribed. We will explore the advantage of pro-social punishment as a new idea to target and help make changes to difficult behaviors. You will receive the tools necessary to gain effective collaboration between clinicians, educators and parents. Through case studies, video clips and class participation you will leave this seminar with the confidence to identify actions that cause impediments in change, utilize more successful consequences for behaviors, and teach new skills to children, adolescents, and young adults with HFA. Don’t just manage these individuals; provide interventions that can lead to successful independence into their adult years! 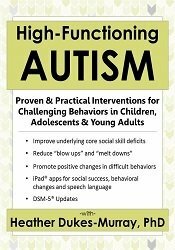 Implement interventions to teach children/adolescents diagnosed with High-Functioning Autism (HFA) the skills to independently manage their own regulation, anxiety and fears. Design effective strategies to approach transitions and routine life challenges for children/adolescents diagnosed with HFA. Utilize specific interventions to improve long-term social-emotional success for children/adolescents diagnosed with HFA. Suggest specific sensory-based calming techniques to reduce anxiety for children/adolescents diagnosed with HFA. Design specific behavioral interventions to reduce frequency, intensity and duration of difficult behaviors in children/adolescents with HFA. PESI, Inc. is an AOTA Approved Provider of continuing education. Provider #: 3322. This self-study course qualifies for 6.0 self-study contact hours or .6 CEUs in the Category of Domain of OT and Occupational Therapy Process. The assignment of AOTA CEUs does not imply endorsement of specific course content, products, or clinical procedures by AOTA. Course Level: Intermediate. Expires: 7/19/2020. PESI, Inc. designates this self-study activity for a maximum of 6.0 AMA PRA Category 1 Credit(s)™. This activity was originally recorded on 07/19/2016. It was last reviewed on 11/13/2018 and is valid until 11/13/2021.